The lighthouse is now part of 37 historic structures, most from the 19th century, where many of the authentic original structural components of each structure have been painstakingly disassembled and reconstructed as part of the outdoor Shelburne Museum complex. In the mid to late 1800’s, the lumbering trade along Lake Champlain was increasing dramatically. About 7 miles northwest of Burlington, and about a mile out onto the lake there were a small group of dangerous shoals wreaking havoc with mariners. This caused the need for a lighthouse to be built on Colchester Reef. 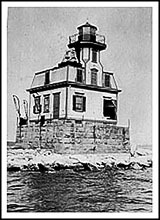 In 1869, the Lighthouse Service ran a national competition for the best lighthouse design, which was awarded to a graduate in engineering from the University of Vermont, Albert Dow. Colchester Reef lighthouse was completed in 1871, but ran into problems with its foundation from the fierce storms constantly pounding the remote light, and ice jams. Supplies initially were only brought to the lighthouse once a year without much input from the light keeper. The first Keeper, Herman Malaney, kept receiving, against his wishes, over nine tons of coal each year, which was much more than he would use. He decided to support the local ice fisherman each year as they would look forward to receiving a bag of coal from the Keeper each winter to heat their ice shanties. On a cold day on January 29th, 1888, Keeper Walter Button’s pregnant wife Harriet went into labor. Keeper Button rang the lighthouse bell for a doctor on shore to aid in his wife's delivery, but the ice was two thin to cross and too thick for the local doctor and his assistant to get a boat out to the lighthouse, located over a mile out on the frozen lake. They decided to risk their lives and try to walk out to the lighthouse. When they were about half a mile out, one of the large ice floes they were on broke apart and sent them drifting away from the direction of the lighthouse. The ice floe then began to break apart again causing the doctor and his assistant to jump from ice floe to ice floe to get to the mainland to safety. Luckily they made it about four miles away from their starting point, and as luck would have it, a healthy baby girl was born at the lighthouse without any medical assistance. Keeper Button one day found a pair of squirrels on the rocks by the lighthouse, which became tame enough as the family’s pets. When William Howard was Keeper at Colchester Reef light, he had problems dealing with the solitary existence at the lighthouse and wanted to move closer towards one of the bigger cities. He met a Keeper from the New York City area, August Lorenz, who longed for a quiet existence away from the noise and crowds of the city. The two decided to swap jobs. Lorenz became Colchester Reef’s Keeper in 1909. Lorenz loved the quiet solitude, even though he had various instances of dealing with extreme temperatures. One time he nearly encased himself in ice from the freezing spray while he was rowing supplies to the lighthouse. He also had to contend with the dangerous ice floes that constantly would bombard the lighthouse foundation. One ice flow tore a large hole in the kitchen area. Lorenz stayed at the lighthouse for nearly 22 years, until 1931 he was forced to retire at the age of 70. The lighthouse was retired in 1933, and fell into disrepair over the years. In the early 1950’s it was sold at auction for $50 with the owners planning to use the lumber to build a house on shore. Electra Webb, a wealthy collector of New England artifacts and memorabilia, who also became founder of the now existing Shelburne Museum, heard about the lighthouse and was able to purchase the lighthouse from the owners for $1300. Webb then had the lighthouse painstakingly disassembled and labeled piece by piece, then reconstructed to its original glory on the grounds of the current Shelburne Museum. 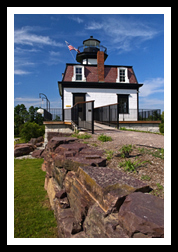 Today the Shelburne Museum has 37 buildings including the Colchester Reef lighthouse where visitors can also tour the inside of the lighthouse. 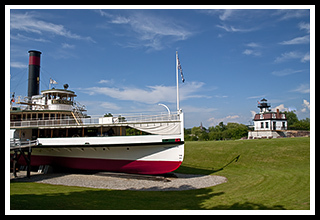 The Shelburne Museum, often referred to, as “New England’s Smithsonian” where the lighthouse is located, is an all day affair for visitors to walk around and tour inside the 37 structures on the grounds, including the famous paddle wheel steamer, the Ticonderoga. It is considered to be America’s last remaining side-paddle-wheel passenger steamer that provided freight and passenger service from 1906 to the early 1950’s. Many of the buildings and structures represent the 19th century. Many of the buildings including Colchester Reef Lighthouse and the Ticonderoga have been painstakingly disassembled, labeled, and then precisely reconstructed to their original states. The National Museum of the Morgan Horse will educate you about this magnificent animal and its part in our nation’s history. Shelburne Farms is an interactive and educational 1400-acre working farm for families and children. Enjoy wine tasting at the Shelburne Vineyard Winery, one of Vermont’s premier vineyards. Take a factory tour of the largest hand-made manufacturer of Teddy Bears in North America at the Vermont Teddy Bear Company. About 5 miles south of the Shelburn Museum, you can stroll around nearly 6 acres of wildflower gardens at the Vermont Wildflower Farm. From Burlington take Route 7 South for 7 miles to Shelburne center. From the center, continue on Route 7 one more mile and you’ll see the Shelburne Museum on the right. You can also see the lighthouse from the road. To view the original lighthouse foundation on Colchester Reef, from Burlington follow Route 127 to the town of Colchester. Turn onto Porter's Point Road, then turn left at the four-way intersection onto Airport Road. This road then turns into Colchester Point Road. From Colchester Point Road, follow as it becomes Mills Point Road, then park at Causeway Park. As you walk out to the causeway you can see the old foundation of the Colchester Reef Lighthouse. 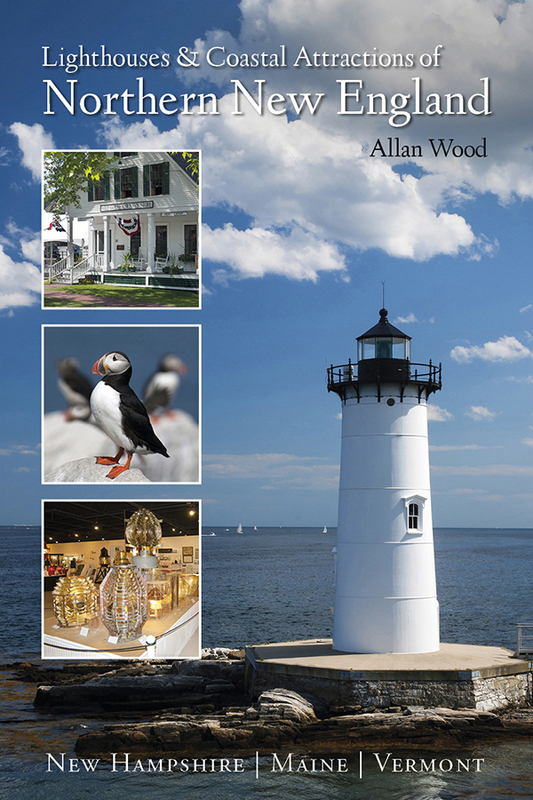 My 300-page book (with over 360 images), Lighthouses and Coastal Attractions of Northern New England: New Hampshire, Maine, and Vermont, provides lots of stories from each of the 76 lighthouses in the northern coast, along with plenty of coastal attractions and tours near each beacon, and contact info to plan your special vacation.